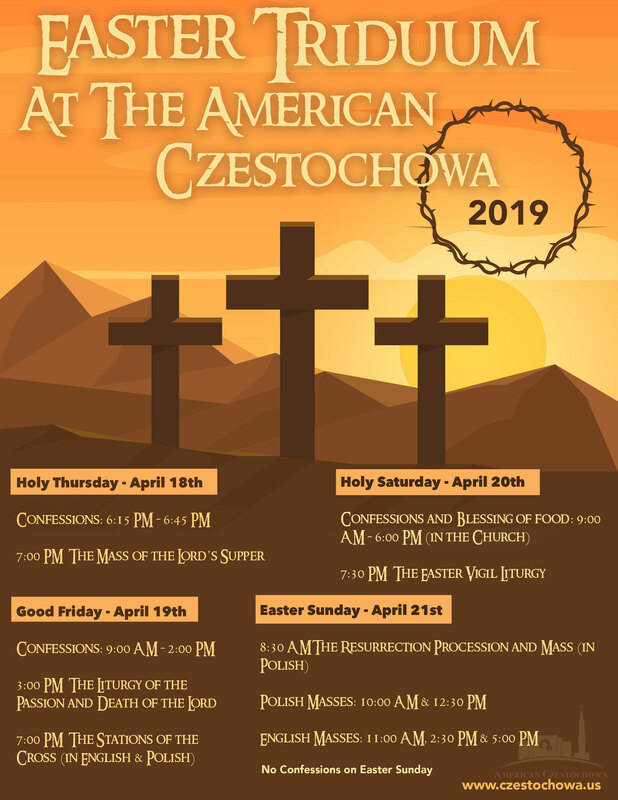 The Pauline Fathers and Brothers invite you to the American Częstochowa for the Easter Triduum, the most important days of the liturgical year, which celebrate the Passion, Death and Resurrection of Jesus Christ. We begin these solemn days on Holy Thursday, April 18, with the Mass of the Lord’s Supper at 7:00 pm. On Good Friday, Confessions will take place from 9:00 am to 2:00 pm in the St. Anne’s Chapel, where there will be a traditional “Repository Chapel”, the Altar of the Blessed Sacrament. The Liturgy of the Passion and Death of Jesus will take place at the Shrine at 3:00 pm, and the Stations of the Cross will be at 7:00 pm in the Upper Church or at the outdoor Stations of the Cross. On Holy Saturday, the traditional blessing of Easter food – “Święconka” – will take place in the vestibule of the Church for almost the entire day, from 9:00 am to 6:00 pm. Confessions and Adoration of the Blessed Sacrament at the Lord’s Tomb will take place in the same hours in the Upper Church. We will start our celebration of the Resurrection of the Lord with the solemn Liturgy of the Easter Vigil at 7:30 pm. On Easter Sunday Mass and the Resurrection Procession will start at 8:30 am. Other Holy Masses in Polish will be celebrated at 10 am and 12:30 pm, while in English at 11 am, 2:30 pm and 5 pm.